Richmond and sixth of Lennox, after but a fortnight had passed since the death of his first wife. The King was much disturbed. He offered to make her a duchess, thinking it was but the title that allured her; but Frances refused the honour, as she did everything at his hands except the jewels he showered upon her, although even these she returned after her marriage. It was at this time, too, that Charles contemplated procuring a divorce from the Queen. But Frances' mind was made up very quickly, and the courtship was a short one. The little Mlle, la Garde was chosen by the Duke to convey to Mistress Stuart the fact that the Duke was dying with love for her. And she was given this quaint message from him: ' That when he ogled her in public it was a sign he was ready to marry her whenever she thought fit." It is strange that Frances, whom the Court generally found so hard to please, and who refused the devotion of so many handsome and attractive men, should have been won so easily by the Duke of Richmond. He was not particularly good-looking, nor very young. We read that he made but an indifferent figure at Court, and Charles thought very little indeed of him. It is clear that the Duke thought that, since Nature had not allowed him gifts enough to gain the Royal favour on his own merits, he could not do better than marry his lovely cousin and obtain it through her. The elopement itself was the most romantic part of this marriage. On a dark and stormy night at the end of March, in the same year, Frances left her rooms in Whitehall unobserved, and met the Duke at the Beare, by London Bridge. Thence the pair proceeded into Kent, where they were privately married. Charles was quite beside himself with rage when he heard the news. Bishop Burnet says that the real reason why the King took the seals from Clarendon was his suspicion that the latter had done his best to bring about the elopement. It would certainly account for the deep resentment the King cherished against his Chancellor to the end of his days, for it was not ordinarily in Charles' nature to be angry with anyone for any length of time. But his affection for Frances was a very real thing-her tantalising coolness and petulance had no doubt done much to increase the devotion of this much-flattered and indulged monarch-and he seems to have set his heart on that divorce. The Queen's Affection for Her and she made her a lady of her bedchamber. Her return to Court was one of the events of the season. She had not seen the King since her marriage, nor had there been any communication between them, and the whole Court was interested in this first meeting between them after that event, for it was obvious that the King was as much in love as ever. But nothing could have been more circumspect than the Duchess's behaviour on this occasion. She conducted herself with extreme propriety and dignity, we are told, which must have been distinctly amusing in view of the childish playfulness which had ever been her chief characteristic. But, however deeply incensed Charles was against Clarendon, it was not long before he forgave Frances and her husband. The Queen herself acted as peacemaker, and in a little more than a year's time the Duke and Duchess returned to Court. Queen Catharine preferred Frances before all the Royal favourites, perhaps because she was the most careless of the King's attentions. The Duchess of Richmond, often known as " La Belle Stuart," one of the most lovely of the fair ladies who graced the gay court of Charles II. From a painting by Sir Peter Lely imitate the country accent to perfection as she asked a boothkeeper to sell her " a pair of yellow stockings for her sweetheart." The country people, full of curiosity and amazement, pursued the Royal party to the Court gates. Many entertaining and romantic stories are told of the King and the Duchess. On one occasion, having ordered his guards and coach to be ready to take him into the Park, Charles slipped off and got into a small skiff, and rowed to Somerset House, where he knew the Duchess was. The garden door was not open, so without more ado he climbed over the wall. How the Duchess received him we do not hear, but she was probably even more ungracious than usual. The Duchess survived the Duke by thirty years, most of which she spent at C o u r t . Charles allowed her a pension of £150,and although the Duke, chiefly by his fondness for drink and gaiety, had much impaired his fortune, his widow was able to buy with what remained the estate of L e thing-ton. Her last years were spent in seclusion,her principal re-creatio.ns being her cards and her cats. She seems to have been interested in art, too, and had a fine collection of original work by Da Vinci, Raphael, and others, all of which were sold by auction at Whitehall at her death, in 1702, at the age of fifty-four. The Duchess was buried in the Duke's vault in Henry VII. 's Chapel, Westminster Abbey, where her waxen effigy may be seen, dressed in the robes which she wore at the coronation of Queen Anne. She figures as Pallas in paintings by Sir Peter Lely and Gascar, while it was she who was the model for the figure of Britannia when it first appeared on our coinage. prev: Beautiful Women In History. 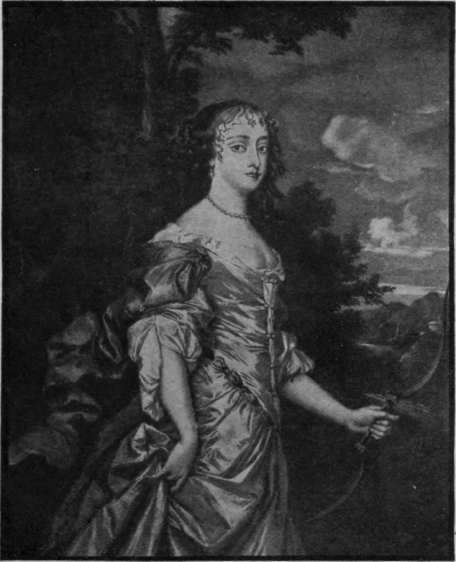 "La Belle Stuart"